Scientists say they've discovered Washington state's first dinosaur fossil. The announcement marks a unique find for the state. Its a rare moment for North America's Pacific coast. 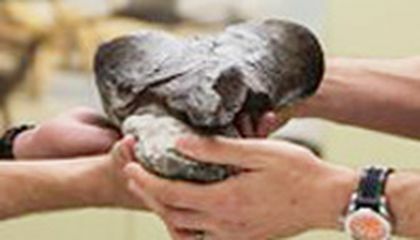 Paleontologists at Seattle's Burke Museum said that the bone fragment is 80 million years old. It probably belonged to an older, smaller cousin of the Tyrannosaurus rex. The bone fragment was uncovered at Sucia Island State Park. That is on the San Juan Islands. It comes from the late Cretaceous period. The findings were detailed online in the science journal PLOS ONE. Scientists haven't been able to identify what specific dinosaur the fossil comes from. It's just a fragment. But they're certain it belonged to a theropod. That's a group of two-legged carnivores. The creature probably died on land. Then it likely washed out to sea. There, it took a beating, scientists say. The fragment was the only fossil uncovered at the site. 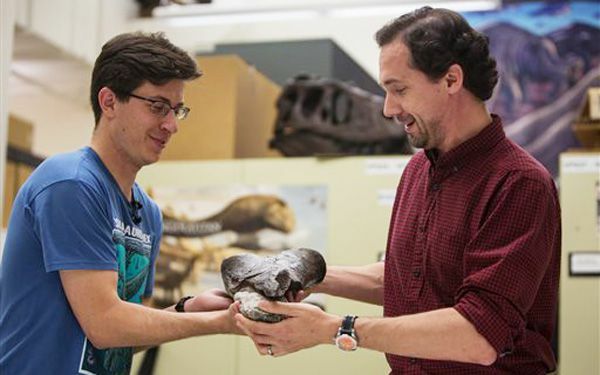 "This fossil won't win a beauty contest," Christian Sidor said in a statement. He is the Burke paleontologist who co-wrote the journal article. "But fortunately it preserves enough anatomy that we were able to compare it to other dinosaurs and be confident of its identification." This is pretty interesting, considering that it is 2015 and Washington still hasn't had their first dinosaur bone until now. That's pretty impossible, having all those years and still no dino bones. I like that washington finally gets its own fossil I'm surprised they found one because they are so rare. For the CTC I think its hard because the shifted a lot over the last millions of years. That's cool that Washington state finally got a dinosaur. The reason that there are not many dinosaurs in the area is because it is theorized that it was probably underwater. According to sources from scientists, they have recently discovered the first dinosaur fossil every to be discovered in Washington State. For the pacific coast in Northern America, this is a very big deal. According to the scientists, the bone fragment that they found was about 80 million years old. They think that the bone was from an ancestor of the tyrannosaurus Rex. Scientists have been unable to determine which dinosaur they bone comes from. This is a very interesting article, scientists have uncovered the first dinosaur bone ever to be found in Washington State. The bone is said to have been about 80 million years old. The first dinosaur bone ever found was recently discoverd in Washington. Dinosaur bones arn't usually found in this area because of is climate. Scientists think this area used to be underwater so thats why the fossil was found. It was found three years ago and scientists have been studying it ever since. They do not kow what animal it is from but they think it was a cousin from the T-rex and that the bone came from a three foot high thigh bone, it is nearly seventeen inches long and nine inches wide it is about eighty million years old. Tho fossilwas probably washed out to sea and that was where it was found on site at Sucia Island State Park in the San Juan Islands. Curetnly it is at Seattle's Burke Museum. It is the secnd bone found in this area tho other is sixteen thounsand year old mammoth tusk found at a Seattle construction site. This si an important find and will hopefully lead to many others. I think it is very interesting that they found the fossil here, we learn that fisssols are found mostly in areas that were once covered in water. My dad has a tusk from a mammoth that was found on a construction sit eso this article was interesting to. This is an important discovery in science that will hopefully lead to other discoveries. I think this article is is cool because discoveries are good and important to us, and it is good for the education and the way you can find different things about it that can lead you to a good direction. 80 million years old! It still continues to amaze me that dinosaurs lived so long ago. I think that this is an awesome accomplishment for Washington, and so is the 16,000 year old mammoth tusk found at a construction site! There are so many dinosaurs, it was crazy! From the velociraptor, to the giagantiraptor, the ever popular T.rex, and countless others! Speaking of the Tyrannosaurus rex, did you know this titan of the Dino world was not the biggest? Compared to some, even tiny! Out of all of the carnivorous two legged dinosaurs, the T.rex was 3rd largest. The other two go in this order; the gigantisauras, an almighty predator who stands about 49 feet long, and the fear of fish, the Spinosauras, an aquatic monster of 50 feet long! Well, that explains why no dinosaurs evolved to fish in these areas. And if they did, they all most likely went running to their dens. It is a really cool discovery that they found a real live dinosaur fossil. It was Washington State's first dinosaur fossil. The fossil was preserved for 80 million years. Since the scientists theorize that the land was uninhabited unless it was underwater, then it might have been above water. The dinosaur must have been small because the bone fragment was a three foot thigh bone. The scientists have done three years worth of research so they must have found out a lot of information. I think that is was a rare and amazing discovery of the dinosaur's three foot thigh bone.